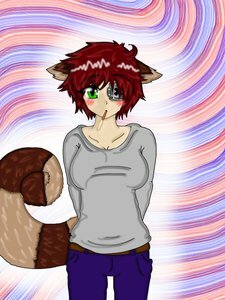 I adopted her from Eeren on DA Her name Kinne derives from the Japanese word "kitsune", which means fox. Her Middle Name is the Japanese name for Loved one. And her Last name means Pure Water!! ^_^!! Thanks for like my Bonk's Adventure style music! Thanks for the watch ♥ !